Simply speaking, making candy is boiling sugar in water. What dictates which type of candy you are cooking is the point when the water stops boiling. There are seven stages of candy making: thread, soft-ball, firm-ball, hard-ball, soft-crack, hard-crack, and caramel. 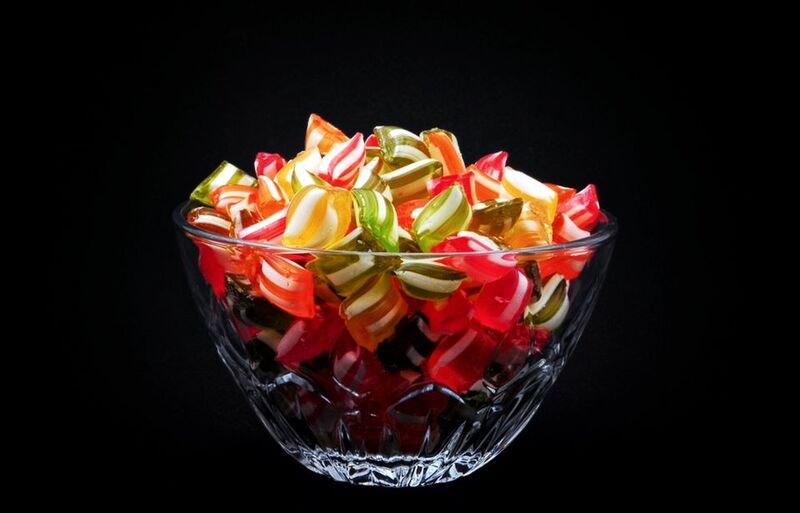 Different types of candy, from fudge to lollipops, need to be cooked to different stages to get the desired results. As the water boils, the temperature rises and the sugar becomes more and more concentrated, creating very different types of confections. Candies that need to be cooked to the soft-ball stage are fudge, fondant, pralines. peppermint creams, Italian meringue, and buttercreams. A candy thermometer is a necessary tool for making candy at home. Each stage occurs at a different and very precise range of temperatures, so keeping an eye on the thermometer will help you know when the sugar has reached the correct stage. If you don't have a candy thermometer, or would like to use an additional technique, you can try the cold water method. Each stage can be determined by what the syrup's consistency is when dropped into cold water. If you are using a candy thermometer and live in a higher altitude, you will need to do a bit of calculating: for every 500 feet above sea level, subtract one degree Fahrenheit from the stage's required temperature. Soft-ball stage refers to a specific temperature range when cooking sugar syrups, occurring between 235 and 245 F. In addition to using a candy thermometer, this stage can be determined by dropping a spoonful of hot syrup into a bowl of very cold water. In the water, use your fingers to gather the cooled syrup into a ball. If it has reached soft-ball stage, the syrup easily forms a ball while in the cold water but flattens once removed from the water. This consistency of a "soft ball" is where the name of this stage originated from. If you heat your candy beyond the soft-ball stage, there is no way to correct your error, since the candy mixture will have automatically moved into the next stage. To avoid this problem, the best bet is to keep your heat source on low. This will allow the candy to heat up slowly instead of quickly overcooking. Also, it's very important to keep a close eye on your candy thermometer. The degree range between stages is not wide, so it's important to watch carefully and remove the candy from the heat as soon as your desired range is reached. Don't be discouraged if it doesn't work the first time. Candy making can be a very precise and tricky form of cooking and it's not unusual to need multiple attempts to get it right. Once you do, the sweet rewards of your time and effort will be worth it!